"Calais, Maine, Milltown, Calais & St. Stephen, N. B., Looking East fro . 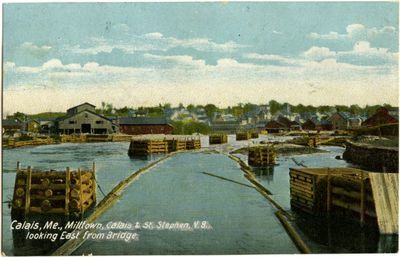 . ."
A postcard depicting an eastward view of Calais, Maine, Milltown, and St. Stephen, New Brunswick, with logs floating down a river. The postmark is dated 1907. Published by the Hugh C. Leighton Co, Portland, Maine.